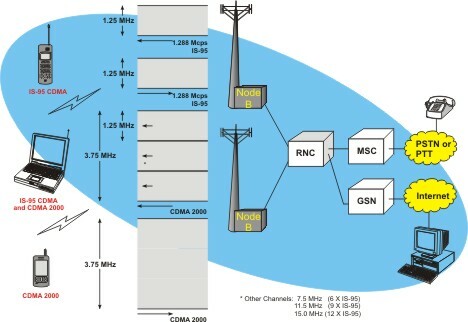 This diagram shows how open loop RF power control can be used in a mobile telephone system to provide approximately the same level of RF signal received by the base station from the mobile telephone regardless of the distance the mobile telephone is located from the base station. This diagram shows that the mobile telephone's coarse (open loop) RF amplifier adjustment is controlled by feedback from its receiver section. The mobile telephone continuously measures the radio signal strength received from the base station to estimate the signal strength loss between the base station and mobile telephone. 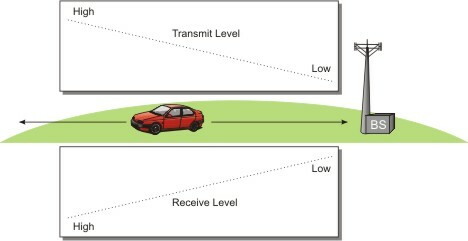 This diagram shows that as the mobile telephone moves away from the base station, the received signal level decreases. When the received signal is stronger, the mobile telephone reduces its own RF signal output; conversely, when the mobile received signal level is weaker, the mobile telephone increases the amplification of its own RF signal output. The end result is that the signal received at the base station from the mobile telephone remains at about at the same power level regardless of the mobile telephone's distance. This figure shows an overview of a CDMA2000 radio system. This diagram shows that there are several types of devices that can be used in the CDMA2000 system. These include CDMA2000 multiple bandwidth radios and IS-95 CDMA compatible mobile telephones. The CDMA2000 mobile telephone devices are usually capable of operating as IS-95 CDMA and CDMA2000 mobile radios. This diagram also shows that the CDMA2000 system can mix and combine standard 1.25 MHz wide IS-95 channels into the 3.75 MHz CDMA2000 channels. This book explains the basic components, technologies used, and operation of IS-95 CDMA systems. You will discover why mobile telephone service providers have upgraded from 1st generation analog systems to more efficient and feature rich 2nd generation systems. You will also discover how 2nd generation systems are gradually evolving into 3rd generation broadband multimedia systems. This book starts with the system components and basic services that the IS-95 CDMA system can provide. You will learn that the key types of CDMA devices include external radio modems, wireless PCMCIA cards, embedded radio modules, single mode and dual mode mobile telephones. You will then discover the different types of available services such as multiple types of voice services, data services, messaging services, and position location services. Explained are the physical and logical radio channel structures of the CDMA systems along with the basic frame and slot structures. Described are the fundamental capabilities and operation of the CDMA radio channel including channel coding, modulation types, variable speech coding, precise power control, and soft handoff. You will learn how each CDMA radio channel has 64 channel codes and that some of these are used for signaling (control channels) and others are used for user traffic (voice and data). Because the needs of voice and data communication are different, you will discover that the CDMA system essentially separates circuit switched (primarily voice) and packet switched (primarily data) services.